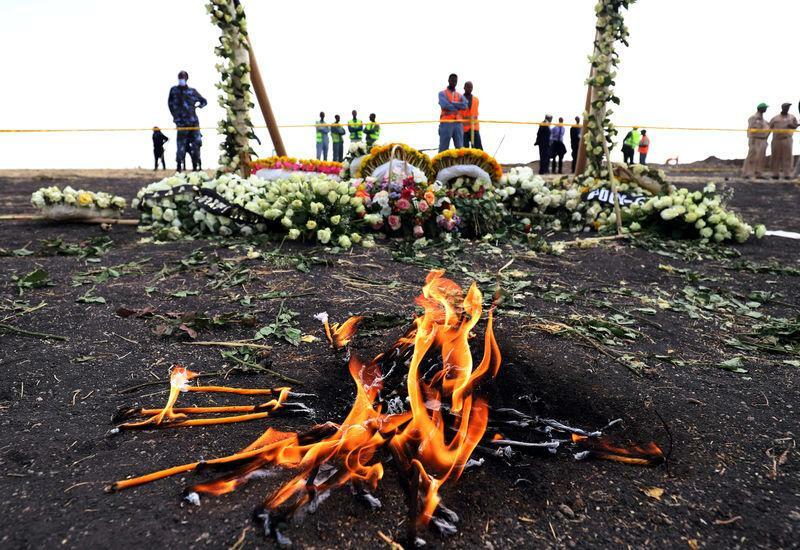 ADDIS ABABA (Reuters) - The chief executive of Ethiopian Airlines has rejected media reports that optional equipment for Boeing 737 MAX planes was critical for safety aboard a flight that crashed this month. The crash of flight 302 and a similar one involving Indonesia's Lion Air in October, both flying the new 737 MAX 8, have cost 346 lives and sparked the biggest crisis in decades for Boeing. Grieving families, nervous travelers and airlines around the world are looking for answers while Boeing prepares updates aimed at getting the 737 MAX, with sales worth $500 billion at stake, back in the air. In a sign of the impact on Boeing's business, Indonesia's Garuda is pushing to dump a $6 billion order for the grounded planes. One focus for investigators is software Boeing installed on the MAX series designed to push a plane's nose down if it senses too sharp an ascent and an indicator that shows that angle of flight. "A Toyota is imported with all the necessary equipment to drive, like the engine and the wheels, but with air conditioning and the radio optional," Tewolde said. "When Boeing supplies aircraft there are items which are mandatory for safety and then there are optional items," he added, noting the angle of attack indicator was optional. Tewolde rejected this, adding: "The angle of attack indicator was on the optional list along with the inflight entertainment system." "We have chosen not to fit this particular optional extra ...it is not a safety critical feature nor is it a requirement by any aviation authority," Norwegian told Reuters. Ethiopian Airlines is Africa's biggest airline with a modern fleet of Boeing, Airbus and Bombardier aircraft and a flying history that dates back to the 1940s. The airline might switch to other Boeing models, Rizal told Reuters, adding it was in negotiations with Boeing while a move to Airbus planes was not under consideration. Garuda rival Lion Air is weighing what to do with an even bigger order following its crash, which killed all 189 passengers and crew aboard. Southwest and United Airlines said they would also review documentation and training associated with Boeing's updates.